Why use the term Origanum instead of Oregano? Because, the word Oregano can apply to plants not in the Origanum genus. Think of the word Oregano as descriptive term instead of a plant. It is a flavor, an essence, an oil. The flavor of Oregano is found in many different genera all over the world. The chemistry of these different 'Oreganos' is similar but not identical. It is these differences which give them their delightful nuances. Most Oregano flavored plants contain carvacrol and often thymol, in addition to various other chemicals. At one time Sweet Marjoram and its offspring were classified as a separate genus. Not too long ago these plants were reclassified into the genus Origanums. This leaves us with culinary Origanums that tend toward the large tomentose Greek Oregano and culinary Origanums that lean toward the smoother, rounder, grayer leaved Sweet Marjoram. Which Culinary Oregano is right for you? Culinary Origanums have varying degrees of Oregano flavor. Use our flavor and intensity chart to select the Culinary Origanum most intriguing to you. Flavor is measured as 1 being close to Sweet Marjoram and 10 being close to Greek Oregano. Intensity is how it numbs your tongue, with 1 being mild and 10 being the spiciest. 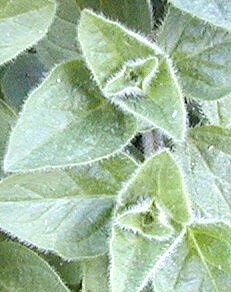 While Oregano can be used fresh, it is most often used dried. By itself it makes a great addition to anything with tomato sauce in or on it, like pizza. With other dried herbs it has endless possibilities. It is often added to chili powder, barbecue rubs, Cajun seasonings, Greek spice mixtures, Herbs de Provence, and Italian dressing seasoning. Culinary Oreganos make a welcome addition to our Edible Flower Herb Garden Six Pack.